Well, its week 2 of Woodland Watch and what a difference a week makes! After a brief visit from the spring sunshine, my walk this week was bracing to say the least! Last week’s soft, muddy paths were frozen solid again and wet patches on the woodland boundaries were frozen into beautiful patterns reminding me of Jack Frost from my childhood games. “Look out, look out…Jack Frost is about…He’s after your fingers and toes”! As Tree Surgeons, this late cold spell has both positives and negative effects on our work. Winter jobs such as planting and hedge laying have been able to continue a lot later than in warmer years, but cold weather can affect young spring growth. Plants can contain up to around 90% water and in cold weather, particularly in frosty conditions, the water in plant cells freezes damaging the cell wall. Frost damaged plants become limp, blackened and distorted. Evergreen plants can turn brown and tender plants can take on a translucent appearance. 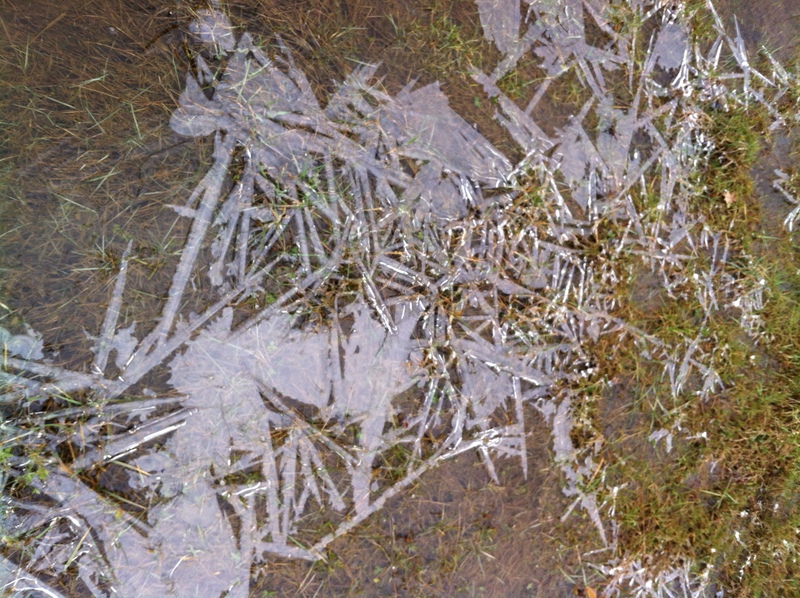 Frozen ground water is also inaccessible to plants’ root systems and prolonged cold spells in spring can cause plants to die from lack of moisture. Although the young spring ground plants don’t appear to be showing signs of frost damage, the usually jelly-like Jews Ear fungus which we spotted last week was frozen solid and brittle with a distinctly shiny appearance. The hazel which makes up a large proportion of the lower canopy level in this woodland has lots of clearly visible catkins. 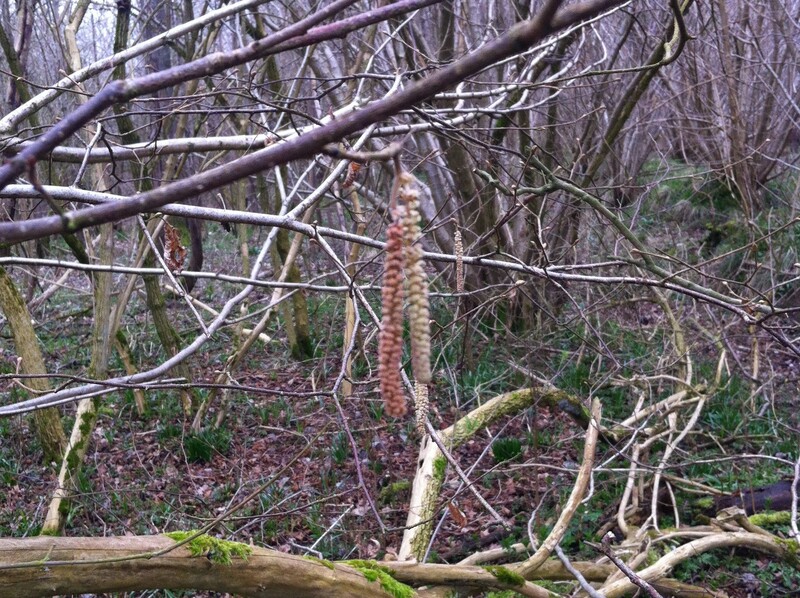 Trees are flowering plants and in hazel (Corylus avellana) the male flowers form catkins such as the one pictured below while the female are single red/pink flowers. I have yet to spot these tiny female flowers in this woodland but will keep a look out in the coming weeks. Pollination mainly by wind, these catkins do not need the bright colours of other flowers to attract insects to pollinate them. Hopefully the weather over the coming weeks will warm up and we can look forward to more signs of spring. Until next week, enjoy your own woodland walks and don’t forget to send us your pictures to office@tree-creeper.com. Walking through a small area of coppice woodland near Malmesbury twice a week, I have watched it change dramatically in just the course of the last 8 weeks. 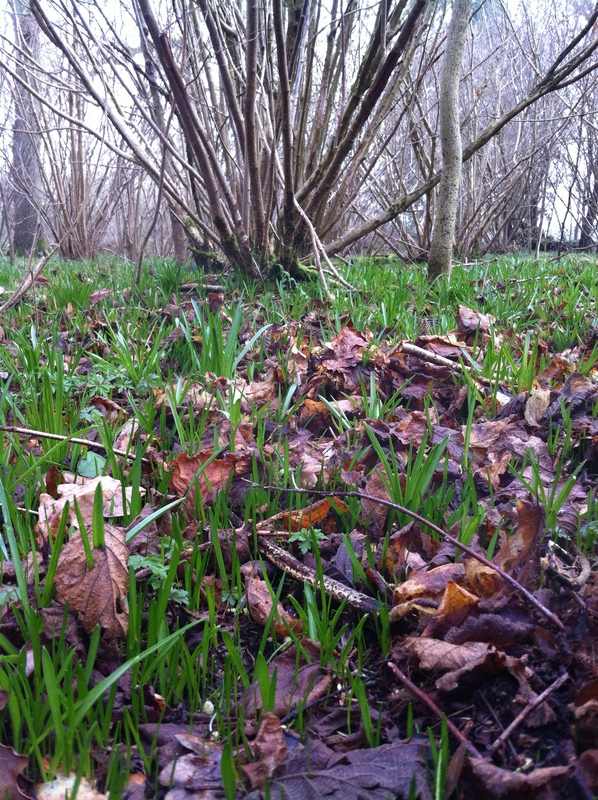 From hard frozen ground and thick snow to the first signs of spring as the woodland floor begins to come alive again after a largely dormant winter. So, without any further ado, lets go for a walk! The first thing I’ve noticed over the last couple of weeks is the colour change on the woodland floor. Where before the ground was frozen hard and covered in a layer of decomposing leaf litter, lush green spring growth is starting to push through. 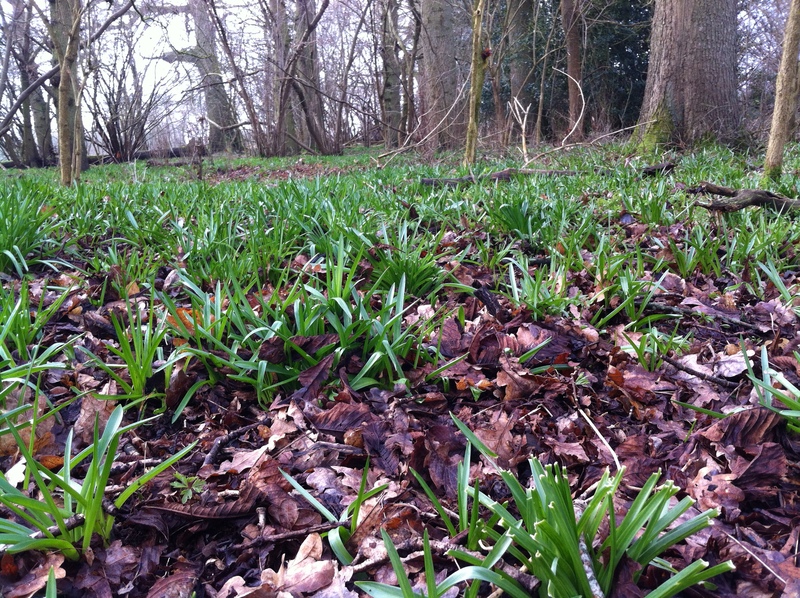 The most obvious are the young bluebells (Hyacinthoides non-scripta), carpeting the woodland floor in their green leaves. Look a little closer at the emerging vegetation and you can see a wide variety of early spring flora, pushing through the leaf litter to enjoy the spring sunshine as it penetrates the sparse canopy overhead. 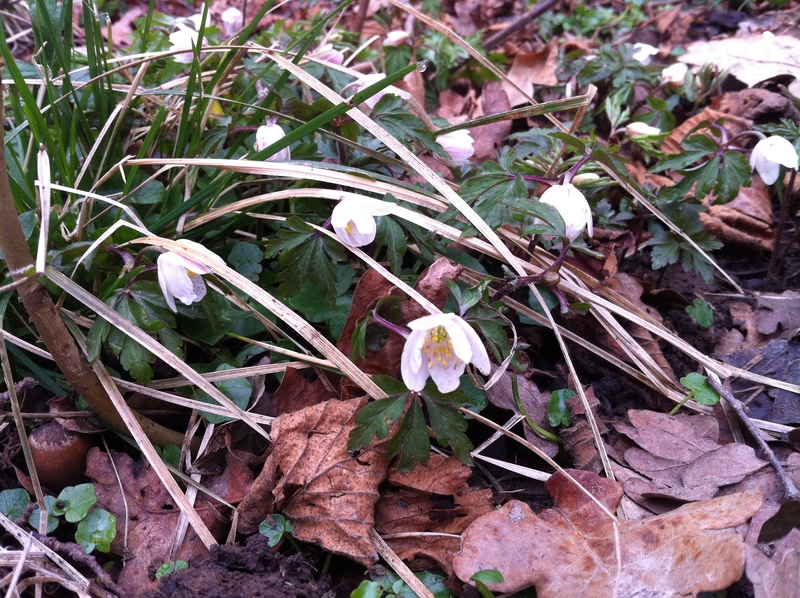 Commonly found in ancient woodland, these wood anemones (Anemone nemorosa) add an early smattering of colour to the woodland floor. 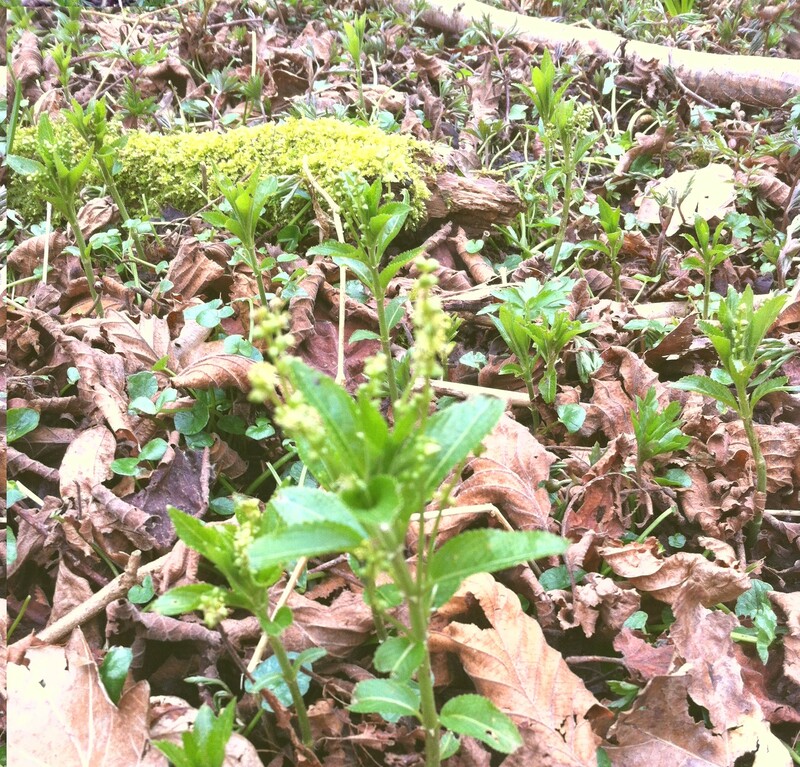 Also visible is young Dog’s Mercury (Mercurialis perennis), a herbaceous perennial often found on alkaline soils and another ancient woodland indicator species. 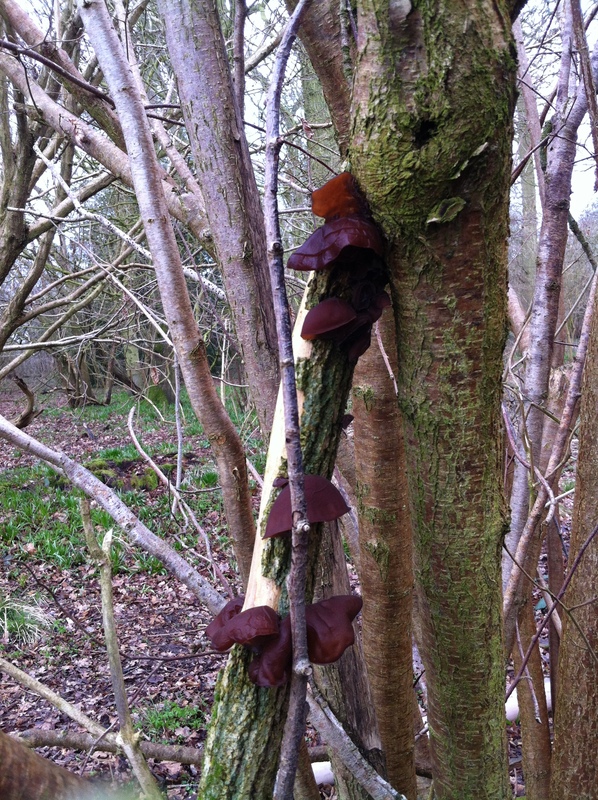 Although most common in autumn, this fungus known commonly as jews ear or jelly ear (Auricularia auricula-judae) can be found year round. 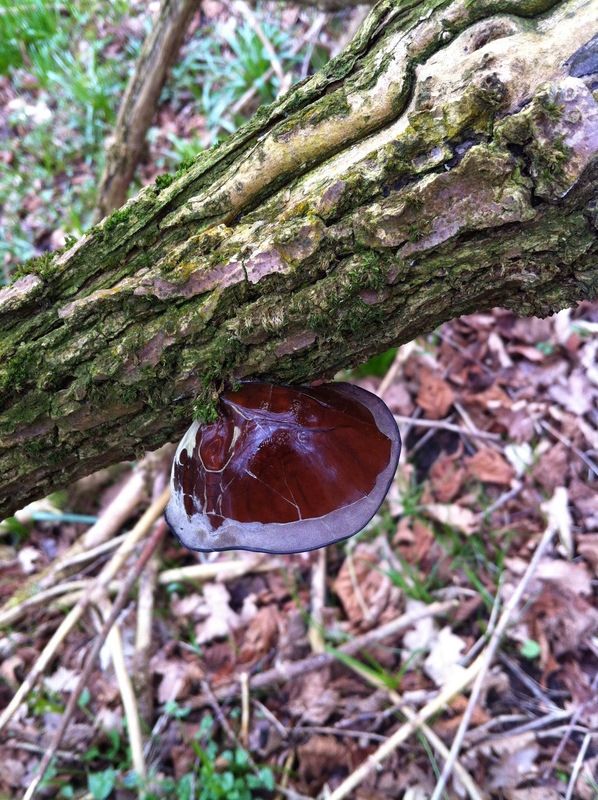 The name jews ear was derived from an earlier name of Judas’ ear, taken from the belief that Judas Iscariot hanged himself from an elder tree where the fungus is most commonly found. An edible fungus when thoroughly cooked, the species is widely used in eastern cookery. Lastly for this week, next time you’re out and about in woodlands take a moment to look around the base of trees for signs of feeding animals. These hazel nut shells found at the base of a large oak tree show both signs of wood mice (an irregular hole with clear parallel tooth marks especially around the inner rim of the hole) and squirrels (shells split and levered in half). 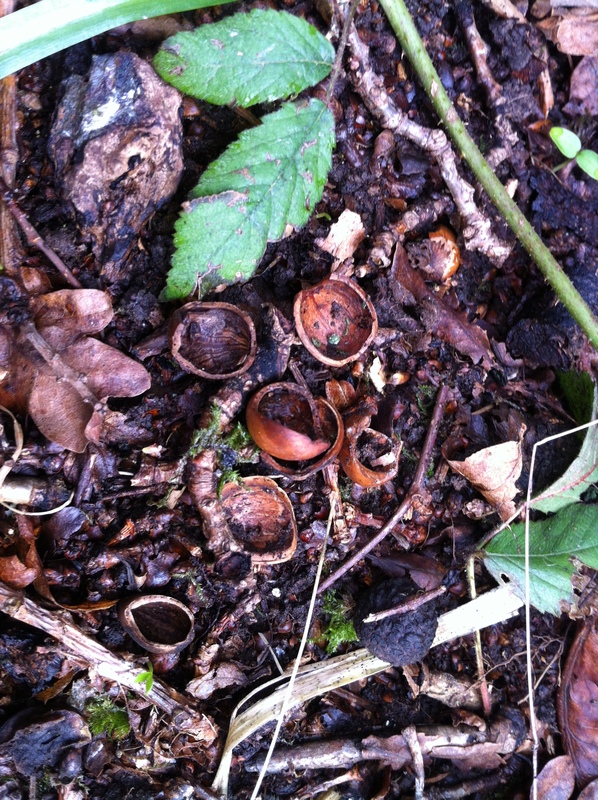 Look out for hazel nut shells dropped under branches rather than around the main trunk with small, neat, round holes with tooth marks on the outside surface as these could be signs of dormouse activity, especially in coppice woodlands. Welcome to the woods! As Arborists, we spend most of our time in the outdoors around trees. We see the seasons come and go and our environment change around us. From the bitter winds of winter to sunny summer afternoons, we see more than most the changes that our country undergoes through the passing of the seasons. However, the nature of our work is such that we rarely get to spend long periods of time in the same setting to observe the changes our environment undergoes. With this in mind, we have decided to return to the same small area of coppice woodland near Malmesbury once a week for the coming year, building up a detailed picture of what we see and how the environment changes with the passing of the seasons.